Posted on 01/06/2014 by Ed Sutton	in Conversations, Edifice & Artifice, Palaces & Vaults and tagged Brazil, Brian Mier, Neoliberalism, This is Hell!. On 19 April 2014, Chuck Mertz of This is Hell! Radio (Chicago) interviewed Brian Mier, an expatriate in Brazil who writes and podcasts about Brazilian society and politics from a critical, radical perspective. Especially refreshing in Mier’s analysis—which preceded last month’s major flare-ups in the anti-World Cup protests in cities across Brazil—is his discussion of U.S. interests being subtly expressed (and served) in Western commercial media’s coverage of the current tumults. In this way, the separate aims of two massively influential neoliberal actors—FIFA and USAID—intersect, and Mier’s observations can be related directly to conversations we have been having on Antidote about other places, especially Ukraine. Chuck Mertz: On the line with us right now is Brian Mier, live from Rio de Janeiro; Brian gives us a Progressive Brazil Report every so often. He recently wrote an article at the North American Congress on Latin America website, entitled The World Cup and the Neoliberal Transformation of Brazilian Cities, and he also has a new post at Vice, Brazil’s World Cup Bungle in the Jungle. Good morning, Brian. Brian Mier: Hey, how’s it going, Chuck? CM: It’s going great! So you had a couple of articles this week. One is about neoliberalism and how it’s changed Brazil since the World Cup was announced. How have the preparations for the World Cup affected your life directly? BM: Directly, it’s affected my life because I got a consulting job analyzing the legal changes in the local government related to the World Cup. So it’s gotten me a job. Other than that, it hasn’t affected my life very much except that it seems like whenever there’s a protest, the police are now authorized to use teargas on everyone. This is new since last year, and I think it’s tied to the lockdown that FIFA requires governments to enact in the lead up to the World Cup. Once the World Cup actually starts, protesting is just going to be illegal. 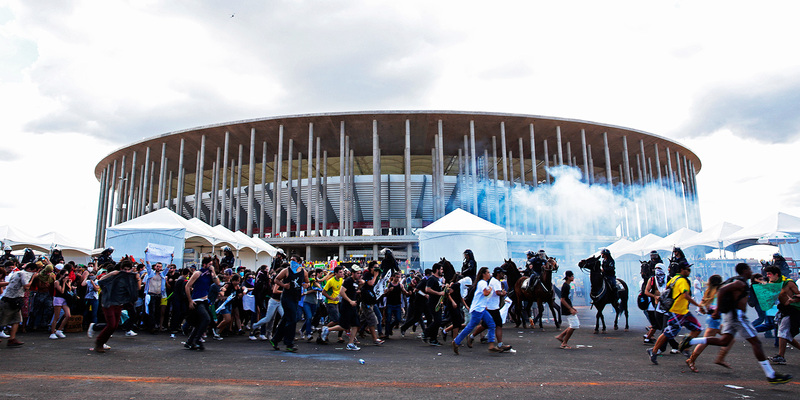 And so at the last few World Cup protests there have been more police officers than protesters out there. More police officers and more foreign journalists. It seems like everyone in the northern corporate media is rooting for Brazil to crash and burn. The New York Times last week had a smear job against Brazil. I feel like the United States government—and other forces in the north—don’t want Dilma Roussef to be re-elected, and they’re using this issue of the World Cup as a way to smear Brazil. It’s getting tricky to talk about. I can be very critical about the World Cup, but I don’t want it to be taken out of context and interpreted as a condemnation of Brazil. Because we’re talking about a country where twelve years ago, when Lula was elected president on the last Workers Party platform, the minimum salary was $48 a month, and now it’s $325 a month. The minimum wage has gone up, in real terms, more than four times. This is why most people down here support the president. She’s 25 percentage points ahead of all the competition in the election polls, but the New York Times ran this article last week talking about how big plans have fizzled out in Brazil and running a bunch of really depressing-looking black and white photographs of a couple big projects that haven’t been finished yet, and quoting some bleak predictions about GDP growth this year that aren’t even that bleak. Because last year, in GDP growth, Brazil beat the U.S., Russia, and the European Union. Despite whatever criticisms I have about using GDP as an indicator of a country’s success—the PT government uses jobs, and they’ve generated four and a half million jobs in the last three years. And a lot of these jobs have come from the World Cup. So it’s a mixed bag. CM: I’m glad that you stress that. The World Cup could be a failure, and the World Cup is something that should be criticized, but that doesn’t mean that Brazil is a failure or the World Cup’s failure reflects something about the government. But is the World Cup an anomaly, kind of? Are you surprised that Brazil actually pursued the World Cup, since it seems to be so much the antithesis of all the progress that Brazil had been making? BM: No, it’s not a contradiction, and it’s not the antithesis. First of all, I’m not a rabid fanatic for Dilma Roussef or the Lula government. I like Lula a lot as a person. There’s all kinds of criticisms you can make. But it’s a complex place, and the good outweighs the negative. Now, the World Cup fits into the general strategy of the government. One of the main reasons that Brazil never entered a recession during the world economic crisis of 2008 is because in 2007, Lula’s government predicted the recession. To counterbalance the risk of going into a recession, they announced a $300 billion economic stimulus package, eight months before the sub-prime market crashed. And this package was based on what a lot of people call Keynesian policies, similar to what FDR did in the 1930s. A lot of money was freed up for the construction sector to do giant public works projects and employ people. And also there was a lot of economic stimulus for the manufacturing sector and for consumption within Brazil. So the government was already spending billions of dollars stimulating the construction industry when it got the bid to do the World Cup, so it makes perfect sense, from a job-generation standpoint, that your government would want to finance stadiums. Now there’s a million problems with the stadiums, but I think that a lot of the critics of the World Cup are ignoring the job figures. In some cases the job conditions have been terrible and the salaries have been low—and in other cases they haven’t. The construction workers in Rio de Janeiro, on the transport lines that are being built, are making thirteen hundred American dollars a month—which is a high salary in Brazil when the minimum salary is $325 a month. So I don’t know. One of the problems is that FIFA has put heavy pressure on the Brazilian government to build these stadiums in cities that don’t have serious professional sports teams. Imagine you’re in Iowa City, and the state governor decides to build a stadium that holds 60,000 people. Who’s going to fill it? At least in Iowa you have college teams. But in Manaus, where this $325 million stadium has just mushroomed up, they don’t even have a team in the fourth division. The best team in the city of Manaus would be the equivalent of a rookie league baseball team in the U.S., not even single-A. CM: But this is what I meant by antithesis—Brazil had finally overthrown their dictatorship. They finally put into power president Lula, who finally took so many people out of poverty. It seemed like things were getting a lot better. The dictatorship was over, and then the dictatorship of FIFA comes in telling them what they have to do. That’s what I meant by antithesis, that’s what surprised me. BM: Well, this is really disappointing. This is true—but just to put things into context: the dictatorship ended in 1985, but most of the politicians that were in power during the dictatorship stayed in office. So to run this country, the ruling party has to enter in coalition, and in order for this coalition to work, they have to include at least one of the dictatorship’s official parties. In the case of PT, their partnership is with the PMDB party, which was an official party during the dictatorship, and the vice president is from that party. So you can say the dictatorship is over, but it has never really one hundred percent ended. Almost 30 years after the dictatorship ‘ended,’ the military police are still immune from law in Brazil. They have their own court system. The police can do whatever they want and not go to jail for it, really; that’s a legacy from the dictatorship. But your point about how it seems ironic that the PT administration would clamp down on civil rights and the right to protest because of FIFA and the World Cup, that’s a very good point. And there’s a new law that they’re trying to pass now called the Antiterrorism Act—it’s sponsored by President Dilma, which is terrible. It gives a lot of dictatorial powers back to the Brazilian government. We know that in South Africa they would just arrest anyone who protested during the month of the Cup. So even though there was some civil society mobilization against the Cup and against the waste of public money, when the Cup actually came around they just started arresting all the leaders of these protest groups, and let them out of jail after the World Cup ended. That’s totally illegal in Brazil, but they’re trying to change the laws to make that happen. It’s pretty disgusting when you think that the president herself spent a couple years in jail during the military dictatorship and was tortured for 22 days at one point, with electro-shock torture. That she would support a draconian measure like this is disgusting. CM: It is disgusting, and I’m glad that you brought it back to torture, because what this reminds me of—the fact that the people who were in the dictatorship were never held accountable for the crimes that they committed—it makes me think about the Obama Administration and how they didn’t pursue people from the Bush Administration who backed torture. Given the lessons that you have learned through looking at Brazilian history, what do you think it means that the Obama Administration refused to prosecute those who were responsible for endorsing the act of torture? BM: Coming from the point of view of an American guy who has been living in Brazil for almost twenty years now, to me that’s just not even vaguely surprising. First of all, we know that in Chicago the police have always been torturing people. And we know that the U.S. government started the School of Americas in Georgia, in which they trained dictatorship personnel and leaders from all kinds of neo-fascist dictatorships in Latin America on how to torture. For decades. There was another Wikileaks scandal last week where they revealed USAID—which is supposed to be the charity arm of the United States government that’s supposed to be helping poor people around the world—they’ve been involved in coup attempts all over Latin America. And there is an office called OTI—Office of Transition Initiatives—within USAID that basically finances NGOs and political groups that oppose presidents the U.S. doesn’t want to see anymore. I read about this last week in NACLA and CPR articles: there’s evidence that this office in USAID has been involved in trying to destabilize governments, obviously, in Cuba. The U.S. government is always trying to destabilize Cuba. But also Venezuela, Ecuador, Bolivia, and possibly—there’s no evidence of this yet, but I feel very strongly that the U.S. government does not want to see Dilma Roussef re-elected this year. And it’s one of the reasons why these media outlets like the New York Times, which you could say are part of what Gramsci or Marcuzzi would call the expanded state, are smearing Brazil right now. They’re trying to create a sense of instability in this country that will favor the opposition, who they hope will privatize the state petroleum company in the future. CM: Let’s just touch on two more things before I let you go. I want to talk to you a little bit about the UPP. This is the new police force that’s trying to ‘pacify’ certain areas in the favelas. The way that you describe them in your article at the NACLA website, it sounds like they are nothing more than neoliberal police, that they’re going in to protect the wealthy and the concerns of the wealthy, and that’s it. Is that what the UPP essentially is? BM: It’s a little bit complicated. My idea about the UPP police is that they’re trying to strengthen real estate or individual property rights in favelas which are located near rich neighborhoods. A favela is a kind of squatters’ community—there was no public housing in Brazil for a long time, so people would just build their own houses on land that they homesteaded on or squatted on, and whole neighborhoods have come up, and about a quarter of the city lives in these neighborhoods now. And there’s no real property rights. These places have been governed for years by organized crime factions. So with the police moving in, the crime factions lose control over the residents’ associations that used to validate, unofficially, house sales. If you wanted to sell your house in a favela, you would go to the residents’ association, they’d stamp a receipt, and they’d have the drug gangs behind them so that the buyer couldn’t try to rip you off. So it’s an attempt to get rid of that system of buying and selling houses, to formalize and legalize land in these neighborhoods so that real estate companies can come in and start speculating. And real estate speculation is what drives the modern city in the post-industrial context. It’s all just gambling on real estate. CM: Are you more frightened by them when you see them on the street than other police forces? BM: No. They’re just regular military police who don’t have any experience. I try to keep my distance from all military police in Brazil (or anywhere). That doesn’t mean they’re all bad—I have some friends who are police officers—but the institution itself is bad. There’s something rotten about it. It’s a remnant from the military dictatorship. They don’t believe in civil rights. Sometimes they shoot teenagers for smoking marijuana even though it’s been decriminalized. That’s Brian Mier! He’s our correspondent in Rio de Janeiro; you’ve got to check out his website Progressive Brazil and his podcast. Brian, always great to hear your voice. BM: Take it easy, Chuck. Transcribed and printed with the permission of This is Hell! Radio. Full interview available now via Soundcloud right here but visit thisishell.net nonetheless, check out what they have going on, and subscribe to their podcast!